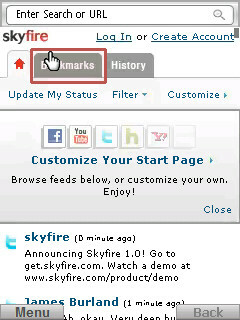 Skyfire 1.0 web browser now available for most platforms! After a lengthy (but evidently productive) beta period, the Skyfire (cross-platform) web browser has now been released as a full v1.0. You may remember that Skyfire, like Opera Mini, is a proxy-based browser, in that all web content is parsed and compressed before making its way to your phone, saving time and bandwidth. Skyfire's main advantages over Opera Mini are that it offers full multimedia (including Silverlight, Flash video, RealMedia, etc) and Ajax support, meaning that it should work with just about any web site. Skyfire's Raj Singh claims that Skyfire have effectively reduced 'click fear'. Read on for screens, what's new, video from The Phones Show 81 (out today) and some useful links. Thumbnail interaction. Now you can click on links immediately after the page loads without having to zoom in. This enhancement is especially helpful for high resolution phones, and for familiar sites where you know right away where you want to click. It makes getting to the content you want on the page simpler, quicker and more efficient. Improved Zoom. Double-tap or double-click to zoom over any element, including links, images or videos. The zoom interaction is smoother and more responsive as well. Best of all: when you zoom in you will get readable text instantly (beforehand, text was blurry and took a while to become sharp). Enhanced Navigation. When you navigate back or forward, you return to the last viewport (e.g. zoom level and portion of the page). Thus eliminating the need to pan and zoom into the section you were viewing on the previous page. Skyfire remembers even the viewport when you select a page from your history. Improved page handling. Enhancements have been made especially for AJAX-intensive sites such as Facebook and Gmail. If larger parts of the page get updated then the client will more quickly and accurately reflect this. Fast start. The developers changed both the sequence and behavior of the Skyfire launch so you get started as quickly as possible. You can type a search or URL in the Superbar while Skyfire is connecting in the background. 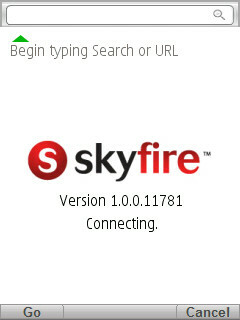 You can put Skyfire to work before the start page is even loaded. Reconnect to last state. When you leave Skyfire in the background, Skyfire will disconnect to preserve battery life. Once you come back to it (after minutes, hours, days) it will reload the same page to the same zoom level and focus. Thus you can continue right where you left off. When you exit and start again, you will always land on the start page. Connection helper. There's a new mechanism in place to detect when connections cannot be established to Skyfire servers. If this is due to a network configuration (common in GSM land), then suggestions are provided to help out. This is especially useful if you are with a carrier/data plan that places restrictions on certain APN configurations, which interferes with Skyfire. Enhanced search results. Google results now include video, news articles, local results all blended on a single results page and ordered by relevance. Vertical search categories are still available. Improved RSS feed search. Find your favorite custom RSS feeds through the improved Add-Feed feature, found under the Customize menu on the start page. Search by site domain, feed URL, or even topical keywords. Remember last connection (Symbian only). Skyfire can now remember the last connection for you, so you will not have to choose a connection every single time. In addition, if you want to change the connection type while you are in Skyfire then you can do so. All S60 3rd Edition phones, a 5th Edition touch-enabled version will be available shortly. Also Windows Mobile devices. HTTP Authentication (e.g. the native browser dialog that asks for username and password when going to certain sites) is not supported. Text entry into Flash or Silverlight plug-ins is not supported. Skyfire does not support ‘local storage’ mode for plug-ins. Thus the following will be affected: Netflix media player, Pandora media player, Rhapsody media player. 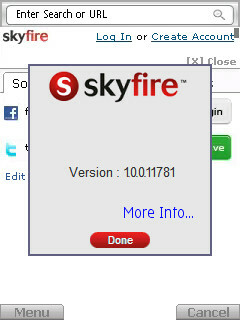 You can upgrade to 1.0 by pointing your browser to get.skyfire.com. 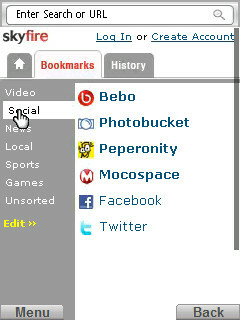 Filed: Home > News > Skyfire 1.0 web browser now available for most platforms!